Unsure of how to start this review, I'll use the hack maneuver and ask if you remember that Black Math Horseman LP that came out on Tee Pee a few years ago. It was a pretty heavy record, and one that I still play quite often. It featured some heavy rock and metal stylings, some quasi-psychedelic tendencies, and the inimitable vocals of one Sera Timms. Not much has been heard of Black Math Horseman since then - they've played some shows, and supposedly are working on a new record. All in good time, I guess. Now I don't mean to suggest this Ides of Gemini record as a substitute, because outside of Timms, the lineup is completely different, and the band has a very different approach to what it does. 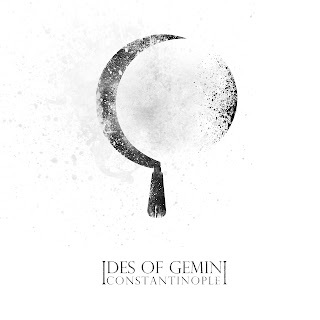 But I will say that if you found Sera Timms's vocals to be enchanting and hypnotic on the Black Math Horseman record, you will love Constantinople, the first full-length from Ides of Gemini. I hate to focus so much on the vocals, because there are, of course, other things of great value going on here, but that ethereal, almost haunting quality that Timms's vocals add to the record is unavoidably the starting point. There are some great riffs on this record, as J. Bennet's guitar playing is always melodic and multi-textured. The often martial drumming of Kelly Johnston is excellent, and along with Timms's bass, provides a rock-solid foundation for the album. But the other instruments (including well-done backup vocals from Bennet and Johnston) fall into the background when Timms is singing. Her voice is powerful without being overly emotive, and one gets the feeling from listening to her that even if she were singing in tongues or vocalizing some random nonsensical noises, she would be difficult to ignore. While the record is somewhat lacking in breadth and scope, it is great for what it is, and is a fine record to sit back and immerse yourself in. The melodies, which you'll find yourself coming back to again and again, can be nearly trance-inducing at times, and make these songs very catchy and memorable. Constantinople is available now on vinyl from Sige Records, and a CD version can be obtained from Neurot Recordings. . For a taste of what Ides of Gemini are about, check out their Bandcamp.